Mung Daal must stop Chowder from selling a dish with rat poison in it. Elsewhere, Schnitzel has trouble making a deposit at the bank. Chowder worries he won't receive the gift he wants on Knishmas. Meanwhile, Mung wants to make a perfect Schmingerbread house, but he may have to buy one from Mrs. Endive instead. How many episodes of Chowder have you seen? Chowder: [to Panini] I'm not your boyfriend! My Favorite New Show...And I'm 36 Years Old! I am a 36 year old mom who watches a lot of cartoons and kid shows (My 9 year old thinks herself Lord And Master Of The Remote). 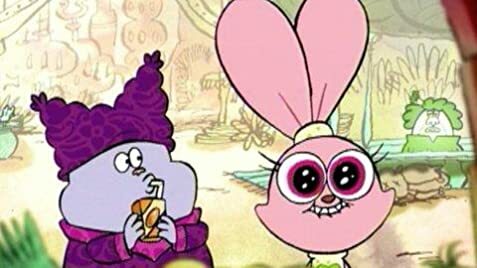 Luckily I like cartoons anyway but nothing could have prepared me for the head-over-heels way I have fallen in love with CHOWDER! 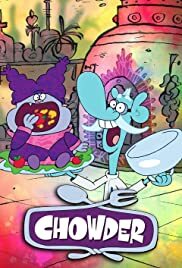 Since this is a new show there isn't much I can tell you: The characters are all really weird looking (What IS Chowder anyway? A cat??? A bunny?????) and one character Schnitzel only speaks using one word: "Radda" (I don't know why this joke never worked for me with CoCo on FOSTER'S HOME FOR IMAGINARY FRIENDS but every time Schintzel says "Radda Radda Radda!" I just fall out of my chair laughing. (For me Schnitzel is the break-through "star" of the show) Most of the story lines so far revolve around food, as Chowder is sort of an apprentice chef. And the jokes are all over the map from goofy to fart jokes to stuff I think is aimed more at the grown up audience. It feels like someone put some stuff from those old BULLWINKLE cartoons, a splash of SPONGEBOB and a tiny bit of FUTURAMA into a blender. This show has that certain type of humor that works for both kids AND grownups. The other day my daughter was at a friend's house and I was watching CHOWDER and my husband came in and asked me why I was watching cartoons. I made him watch it and I felt totally embarrassed as I proceeded to laugh so hard that I actually cried! He didn't feel as strongly as I did about it, but he DID agree it was a "pretty good show". I'm glad to come on here and see that I am not the only person older than 12 who enjoys this hilarious, bright,witty new show! On A Scale Of 1 - 10 I give CHOWDER 9 Raddas!